Getting my students to complete the course readings is one of the biggest challenges I face as an instructor. I know that there are many debates about the effectiveness of a textbook, but I have found that most students feel comfortable with a text because it provides general information in chronological order that helps them developing a grounding for the course. (I know this because every semester I ask my classes if they want to use a textbook). Thankfully my institution offers a book for only five dollars. Now, how do I get them to read it? Several years ago I began assigning a daily journal entry. The project has changed over the years, but the core objectives remain intact. First, the journal introduces the students to the reading material before they arrive in class. Second, it helps them to develop a foundational knowledge of United States history. Third, the assignment provides my students with some talking points that they can use during class discussions. This means that students who are typically hesitant to speak have some knowledge of the material and feel comfortable sharing their findings. Finally, the journal helps each individual to improve h/er reading and note-taking skills. My syllabus lists the reading assignment for each class. The students are directed to complete a separate journal entry for each reading. The journal is simple. Each student is to “outline” or “take notes” on the assigned reading. On the first day, I demonstrate on the whiteboard one way I would take notes on a section from the passage. Together, the class and I read the first section of the text and then discuss what the most important takeaways from the reading are. I then list these in outline format complete with details (like names, dates, places and other relevant information) on the board. I tell the students this is one way to take notes, but not the only way. I don’t want them to feel pressured into following my example; instead, I want each one of them to find a note-taking strategy that works for them. The journal assignment is due at the beginning of each class. I almost always assign an in-class group activity that takes roughly ten to fifteen minutes. During this time, I walk around the class and ask the students to see their journal entries. If they have one completed, they get an automatic ten points. I don’t proofread or scrutinize. I just check to see if the journal assignment is present in their notebook. 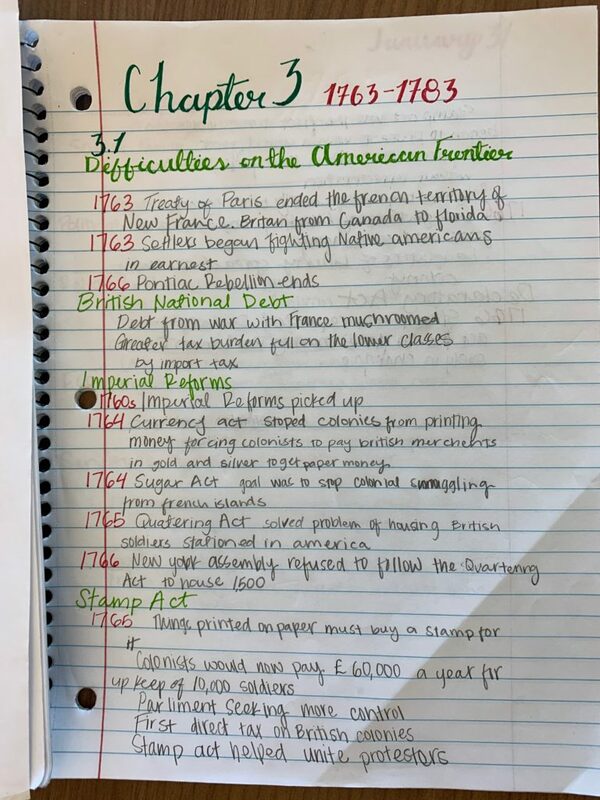 One of the most valuable takeaways from this project is that the students learn effective note-taking and reading strategies early in their educational career. I know that there are many reasons why students do not like to read or take notes, and I have found that one cause is because they feel overwhelmned by the language or find note-taking too time consuming. Every semester I hear from at least one student that it took h/im five hours to take notes on one reading! This, of course, is frustrating and may prevent an individual from completing future readings and put them behind in the course. When I studnet tells me s/he is struggling, I sit with the student and to look through h/er notes to figure out what can be eliminated to make the process shorter. During that first two weeks, I also encourage them to find ways to reduce the amount of time they spend reading and note-taking and offer tips. I reassure them that at first note-taking can be time-consuming, but it gets easier with practice. I explain to them that this assignment challenges them to reflect on their habits and to develop a more productive way to record information with little pressure. It only takes a couple of weeks for the majority of the students to hone their skills. I am not going to lie; by the end of the semester, the students are as sick of completing journal entries as I am of checking them! Yet, there is value in this project. 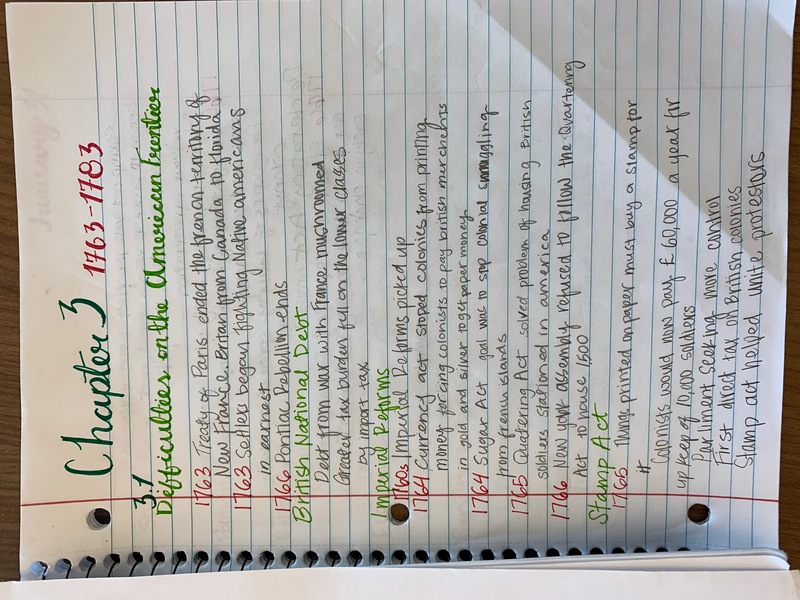 In addition to gaining a general knowledge of American history, my students also develop skills needed to succeed as a student in upper-divisional classes.